We are happy to report, that in mid-June we were invited to cooperate in the 4th National Satirical Competition „Manufacture of Satire”. The competition is organized annually by the City of Żyrardów. The aim of the event is to popularize the unique, industrial history of the city through the art of satirical cartoons. It is send to the professional cartoonists as well as the students of art schools. The exhibition of the finalists works is presented also outside Żyrardów, visiting selected cities, to the applause of the guests. This year’s presence of or Association among the partners of the competition is not a coincidence – this time the main topic of the competition is railway. 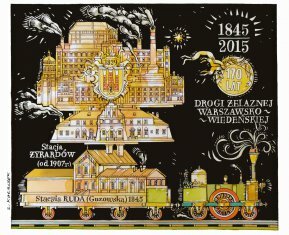 The originators of the event decided to celebrate in this way the 170th anniversary of Warsaw-Vienna Railroad and underline railway’s significance to the development of the city and its industry. The topic of the works can range from past, present and future of the railway, rolling stock, stations, travel by rail etc. More detailed rules of the competition are published on the official website of the event. We hope that the upcoming after-competition exhibition will arrive also at our Shed.